Nationality: American. 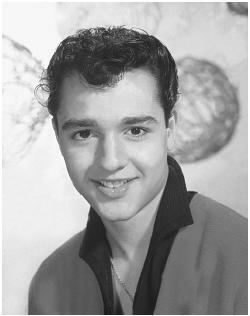 Born: Salvatore Mineo, Jr. in the Bronx, New York, 10 January 1939. Education: Attended Christopher Columbus High School, New York. Career: Child actor on Broadway in The Rose Tattoo ; 1952—appeared in The King and I on Broadway; 1955—film debut in Six Bridges to Cross ; also appeared on television; 1969—director of stage play Fortune and Men's Eyes in New York. Died: Stabbed by robber, 12 February 1976. Braudy, Susan, Who Killed Sal Mineo? (novel), New York, 1982. Cook, G., "Three Days to Grow Up," in Photoplay , July 1961. Ciné Revue (Paris), 24 June 1982. Smith, Laura C., "Untimely End for a 'Rebel,"' in Entertainment Weekly , 10 February 1995. Hatch, George and Jessie Lilley, " Who Killed Teddy Bear?/ Jan Murray," in Scarlet Street (Glen Rock), Winter 1995. Jones, Marvin, "Don Johnson Remembers Sam Mineo," in Scarlet Street (Glen Rock), Winter 1995. Sal Mineo's career was dominated by a single role that swiftly achieved the status of icon or myth: his Plato in Nicholas Ray's Rebel without a Cause . Ray's film, its intense and powerful dramatic inspiration intermittently transcending its "textbook sociology" basis, is a striking example of a great opportunity almost seized and then fumbled: it opens up the possibility of constructing an alternative, nonrepressive and nonauthoritarian sexual/familial structure then opts for restoring "normality" at the end. Significantly, the vital move for completing this operation is the elimination of Plato, the character who, far more than Jim (James Dean) and Judy (Natalie Wood), resists assimilation into the norms of bourgeois culture. Rebel is the only film in which Mineo's character is clearly coded as gay. Typically, as with the film's other teenage characters, his "problem" is "explained" in terms of an unsatisfactory family background; nevertheless, during the central sequences in the abandoned mansion, Plato's gayness achieves a resonance that escapes the film's glib sociologizing. The three characters move towards becoming an alternative family, mutually caring and protective, Jim as father, Judy as mother, Plato as child. Yet this is disturbed and complicated by the continual threat (produced as much by the sexual ambiguity of the Dean persona as by the presence of Mineo) of a sexual dimension to the men's relationship: the implications of connecting the familial and the sexual in this way could scarcely be more radical. The strategy by which the film repudiates (rather than resolves) those implications is interesting: Jim becomes preoccupied with Judy at Plato's expense, subsequently rendering him impotent by removing the bullets from his gun, hence unintentionally abetting in his death at the hands of patriarchal authority (in the form of the police). Thereafter, in the film's famous last line, the heterosexual couple can be definitively reestablished and reintegrated into bourgeois normality. Mineo's persona has two aspects, vulnerability and aggressiveness. If Rebel offers the most complete realization of the former, the latter perhaps received fullest expression in Cheyenne Autumn , where Mineo played a transgressive and intractable Indian brave. It was Preminger who made possible the ideal fusion of the two sides: the young Irgun initiate of Exodus is surely Mineo's finest performance, though achieved through the explicit repudiation of the persona's gay connotations. ("They used me as you would use a woman.") The extraordinary intensity of the interrogation scene is due as much to Mineo's vulnerable/aggressive dualism as to Preminger's iron control over editing and mise-en-scène.